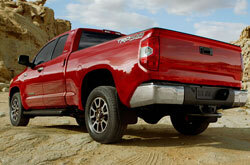 The tough, rugged 2015 Toyota Tundra comes exclusively with an all-V8 engine lineup this model year. The new variants provide additional power across the Tundra roster and deliver excellent performance. On top of this modification, the latest model comes with a fresh TRD Pro model, an available spray-in bedliner, an optional integrated trailer brake on select models and rear under seat tray storage on specific Double Cab editions. Read our 2015 Toyota Tundra review below to discover full details about the latest model and each of its outstanding qualities. The highlight of the 2015 Toyota Tundra in Evansville is the new TRD Pro model. The high-end off-road pickup is outfitted with 18-inch TRD black alloy wheels and a black grille, along with TRD bed panel stamping, matte satin black badges, black headlight bezels and skid plate. The front of the truck has also been raised two inches and wheel travel has been extended to all four corners. High-performance Bilstein shocks are included on the TRD as well, enhancing the overall ride. In addition to these changes, the model is available in three color options: Super White, Attitude Black and Inferno. Two strong V8s are the only engines available on the 2015 Toyota Tundra in Evansville. The standard 4.6L i-Force V8 delivers 310 horsepower and 327 lb.-ft. of torque, while working alongside a six-speed automatic transmission. The more powerful 5.7L i-Force V8 exerts a hefty 381 horsepower and 401 lb.-ft. of torque. This engine comes with the same six-speed automatic transmission as the 4.6L V8, creating top-notch performance on both all-wheel-drive and four-wheel-drive models. If you'd like to read additional info about the Tundra's incredible features and amenities, continue browsing our 2015 Toyota Tundra review. You can also view photos of the brand-new model and check out its unique engine specs! 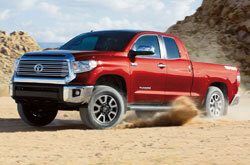 The 2015 Ford F 150, Chevrolet Silverado, Dodge Ram and the GMC Sierra are no match for the 2015 Tundra! Just compare Toyota's latest model against them and you'll see that it wins over the competition easily. 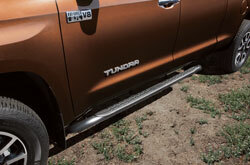 The Tundra's got several terrific qualities, including its convenient features and marvelous exterior styling. When compared to the competition, in terms of price it's clearly a truly amazing value, making it a well-liked choice among Toyota customers in Evansville. Find out more - Catch a glimpse of the bullets under this paragraph! Thanks for choosing Kenny Kent Toyota as your resource for 2015 Toyota Tundra reviews and comparisons. We take our job to provide the best reviews authored by automotive experts - it's just one more thing that makes us a leading Toyota dealer in Evansville. Once you start reading, you'll find that this article is crammed with vehicle specs in a clear format that's easy to read. Use it to get the info you need to make an good purchasing decision. Now that you've learned all about the 2015 Tundra, we'd love to talk about how we can help you; message us today to learn about exclusive dealership offers and arrange a test drive!